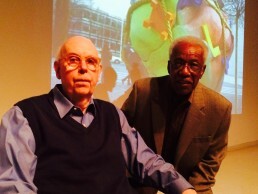 Nearly 70 people attended PGAAMCC's 'Artist Talk' for the current exhibition 'Transforming Anew: Perspectives on Black Men' on Saturday, March 21. Curator Jon West-Bey moderated the lively two-hour conversation about the images of black men and how recent events in Ferguson, Mo. and Florida inspired the provocative pieces featured in the exhibition by artists Chanel Compton, Nehemiah Dixon and David Ibata. Attendees eagerly engaged the artists with questions about interpretations of their work and how personal experiences in the United States and travels abroad may have influenced the artist's work. Curator Jon West-Bey( Left), moderated an engaging conversation with artists Nehemiah Dixon (center), David Ibata and Chanel Compton (far right) explain the meaning of their images of black men. 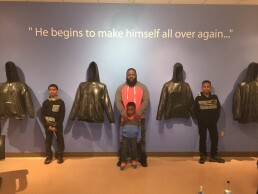 'Transforming Anew: Perspectives of Black Men' will be on display at the Prince George’s African American Museum and Cultural Center from February 6th, 2015 until April 25th, 2015. For more information call (301) 809-0440, email programs@pgaamcc.org, or visit the Museum’s website at www.pgaamcc.org. 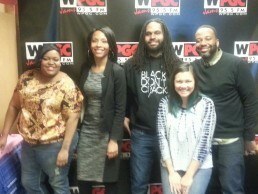 Dr. Donald Wallace Jones, Dr. Betty Jean Tolbert Jones and Ms. Tracey Tolbert Jones and also Mary-Frances Winters, President and CEO of The Winters Group, Inc.
Nehemiah Dixon and Chanel Compton, artists featured in our provocative exhibition 'Transforming Anew: Perspectives of Black Men' were guests on the WPGC-FM Joe Clair Morning Show on March 19. Chanel, who is also Educational Director, and Nehemiah led a spirited conversation with host and comedian Joe Clair about historical and contemporary references of black men. The museum is closed this week, but please join us this Saturday, March 21 from 2:00pm to 4:00pm as we continue this much needed conversation during our 'Artist Talk.' This exciting panel discussion will moderated by Curator, Jon West-Bey. This event is free to the public. 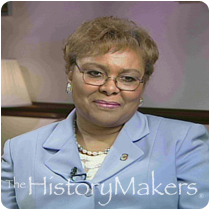 The exhibition will be on display at the Prince George’s African American Museum and Cultural Center from February 6th, 2015 until April 25th, 2015. For more information call (301) 809-0440, email programs@pgaamcc.org, or visit the Museum’s website at www.pgaamcc.org. Join us this Saturday, February 28th from 6 - 8 pm for the opening of our newest exhibit, Transforming Anew Perspectives in Black Men featuring the artwork of Chanel Compton, Nehemiah Dixon and David Ibata. If you can brave the brisk weather this season, try to enjoy a nice walk or drive around Historic North Brentwood while learning history! 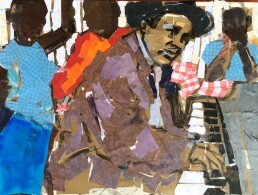 PGAAMCC presents 4 public art installations that celebrates the history, art, and culture of North Brentwood; the first Historically Black Township of Prince George's County. The public art is located at the Prince George's African American Museum & Cultural Center (PGAAMCC), Baby Dee's Guest Club, Gwendolyn Britt Senior Activity Center, and the Gateway CDC. Artwork produced by our very own Educational Director and prolific, muralist, Chanel Compton. This project is sponsored by Art Lives Here and Gatweway Community Development Corporation. The Culture Keepers Saturday Field Trip was awesome! On Saturday November 15th, Culture Keepers students and coordinators from CVPA Suitland High School and Northwestern VPA, who were able to attend, went on a arts & cultural field day to museums and had a blast! 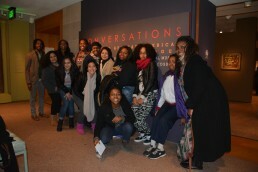 We visited the National Museum of African Art exhibit "Conversations: African and African American Artwork in Dialogue". It was so exciting to see traditional and contemporary African and African American artworks together exploring themes in family & community, resistance & social justice, and spirituality. We also visited the Hirshhorn Museum’s multimedia exhibit, "Days of Endless Time" and historical and cultural exhibitions at the National Museum of the American Indian. Special thanks to the amazing and dedicated staff of PGCPS and contributors of the Culture Keepers program: Maria Saldana, Jamea Richmond-Edwards and Roxanne Francewoods. Keep on keeping up with Culture Keepers! My Friends, thank you again for your unwavering support of the Prince George’s African American Museum & Cultural Center at North Brentwood (PGAAMCC). We promised you an update on our progress in securing funding to build out the Museum after 18 years of being on the Planning books for Prince George’s County. Initially, we were placed in the Park and Planning CIP Budget under a County Bill in FY12 that allocated $5 Million dollars of funding for the construction of the Museum Building. Due to your efforts, we are now moved to the FY15 County Construction in Progress (CIP) Park and Planning budget . We are happy to report that the sale of our properties was executed in June of this year. As a result, we will be able to keep our doors open. However, we retained sufficient property to build out a 10,000 SF addition to our existing Museum and make this 18 year dream still come true. Continue to support the Museum and participate in our Public and Educational Events and Programs. Continue to Donate, Sponsor and become a Member or a Partner organization. Know that whenever you come to the Museum or our events, you will always be “Welcomed Home”! Again, thank you so much for all you do for the continued success of the PGAAMCC.